No need AAA batteries,Save cost.Built-in rechargeable battery operated(High-capacity 1000mAh),providing much longer time for lighting than old version which use AAA batteries,recharged by any 5V USB devices(like USB Adapter,power bank,laptop) with included charging cable. Aluminium alloy shell with integral magnet inside,so very easy install this light strips without any tools in 2 ways.WAY 1: Just free attach to any ironwork surface,like refrigerator,barbecue;WAY 2:First stick the included metal strip with double-sided tape on any non-ironwork,clean surfaces,than attach the magnetic light bar.Portable,Free exchange places per your desires. PIR Motion Sensing & dusk to dawn photocell functionality.Human movements activate,AUTO Light On/Off,could apply to all applications for your home illumination.A perfect intelligent security lighting for cupboards,hallway,porch,wine racks,bathroom,passageway,anywhere you need lights. 6000-6500K daylight,10 LED bulbs,provding up to 100 lumen illuminations(More bright than which use AAA battery).Comes with 1 YEAR WARRANTY by Moston,refund or replacement without asking. *Keep away from heat source,humidity, rain(As it is not water-proof) . *Avoid to install 2 light bars closely. *Make sure to clean the flat surface before sticking. Detecting human motions within 3M/10ft,120 degree angle. last 20 secs after activated,if no more motion trigger again,than auto off. Option G:motion sensing and photocell functionality,auto light on only when movements detecting in the dark or at night. 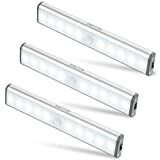 Option On:always give lights,like a flashlight,no motion&light sensor feature. Lithium Battery:3.7v 1000mAh,span life 500 cycles for charging/discharging. “Red”, means charging,”Green”,means fully charged and ready to use.Please fully charge before using for the first time. When low power occurs and system will be powered off automatically,please charge it in time.If you don’t use it for a long time, please charge it at least once a month so as to increase its battery life time.Operating temperature should be in the range of -5 ℃ to 40 ℃.